This movie is the reason I know the difference between “libel” and “slander” (in addition to two years in J-school). “Libeled Lady” has some pretty typical 1930s characters – a wealthy, beautiful heiress (Myrna Loy, queen of the screen), a fast-talking, wise-cracking newspaper man (Spencer Tracy), a suave con man (William Powell), and everybody’s favorite sharp-tongued blonde, Jean Harlow (a 1930s institution herself). Connie Allenbury (Myrna Loy) is suing the newspaper Warren Haggerty (Spencer Tracy) works for, because it printed a story saying she was the “other woman” responsible for breaking up a famous marriage. Naturally, she denies any involvement and is suing the Star for $5 Million dollars. Think of that in 1936 dollars, not 2014 dollars. It still is a lot of money today…imagine how unreal that sounded to a country that (the majority of which) was coming off the backside of the Depression. As Haggerty exclaims, “There isn’t that much money in the world!” Anyway. Turns out, the Star printed the story without any hard proof, and has no defense against the suit. $5 million dollars would destroy the paper. So, Haggerty calls his old friend Bill Chandler (William Powell), who’s what you might call a “fixer.” His job is to hook Connie into some sort of scandal. For this, they need a partner – Haggerty’s fiancé, Gladys (Jean Harlow). The idea is that Bill and Gladys will get a paper marriage, Bill will find some way to woo Connie, Gladys will file for divorce citing Connie as an involved party (you could do that back then, and after working 2 years for divorce lawyers, I kinda think they should bring it back, but anyway), Connie will lose her “moral standing” to sue the Star, and everyone gets to waltz off into the sunset like nothing every happened…except, of course, Connie Allenbury. There are only a couple of hitches to this plan. First, Gladys hates it. She wants to marry Haggerty, not Haggerty’s friend. She certainly doesn’t like being some sort of token wife that’s going to get her name in the papers involved some major scandal. To keep her in on the deal, Bill starts flirting with her – not seriously, but enough to keep her distracted from her own frustrations and to keep her from spilling the beans at the wrong moment. Unfortunately for him, the plan backfires, and Gladys misinterprets his attentions as genuine, which means she may decide she wants to fight for her legally-bound husband rather than file for the quickie divorce that’s essential to the plan. The second problem? Bill finds out Connie is actually a really good person. She just happens to be mind-bogglingly wealthy. The more time they start spending together, the more his conscience starts to bother him about the entrapment. And as he gets to know her, he starts developing genuine feelings for her. And vice-versa. Suddenly we have Gladys deciding she’s too good to be a farmed-out fiancé and wants to stay married to the man she actually married, Connie falling in love with the man who was hired to make her a permanent public disgrace, Bill trying to protect Connie while at the same time keeping the pretense up for Haggerty (who will drag him into a very public breach of contract suit if he doesn’t fulfill his end of the deal), and Haggerty slowly realizing that getting his girl married to somebody else, even as a trick, probably wasn’t the best game plan. This is a fantastic comedy, and a brilliant showcasing of all the principle four’s most signature skills. 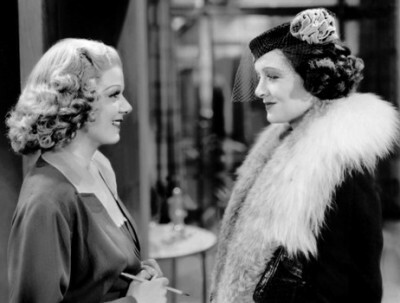 And Myrna Loy, my absolute favorite female star of all time, with Jean Harlow, who’s #2, both showcased equally (though very different styles) and beautifully. Gotta love it. And I love Spencer Tracy in comedies. I know he gets most of his fame for dramatic roles like “Boys Town” and “Guess Who’s Coming to Dinner?”, and he deserves it, but he had a great sense of humor and can go toe-to-toe with Harlow’s verbal punches. And you just don’t get better on-screen chemistry than William Powell and Myrna Loy. You just don’t. The dialogue is snappy, the plot is actually pretty strong, and frankly it’s impossible not to enjoy yourself watching this one. All four of them deserved nominations for this. I especially think it adds a fun undercurrent when you know that, in real life, William Powell and Jean Harlow were actually a couple. Their “married” sparring is even more entertaining! “Libeled Lady” will be on TCM on Monday, February 10, at 1:00 pm CST. How have I not seen this movie yet?! It is definitely being added to my list. I love your blog! (especially how it is designed-super cute). I just wanted you to know that I have nominated you for the Liebster Blogging Award! Stop by my blog for all of the questions and rules! I hope you participate and let me know if you do so I can check your post out as well!